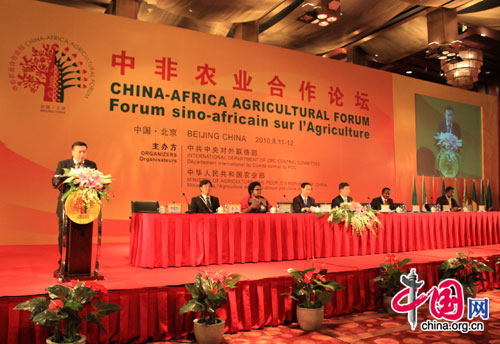 With a common mission of tackling food safety issues and developing sustainable agriculture, China and Africa should take it as their duty to promote cooperation in agriculture, said Wang Jiarui, China's minister of the CPC Central Committee's International Department, at the China-Africa Agricultural Forum Wednesday in Beijing. The forum is an ideal platform for both sides to discuss opportunities for cooperation, ways to exchange information and technology and possible projects, he added. As of 2009, China has invested more than US$134 million in Africa, and in that year, the trade volume between the two reached US$2.8 billion. Since 2004, China has sent more than 900 agricultural experts and technicians to Africa to train 4,200 agricultural management officials and technicians, while constructing 14 demonstration centers for agricultural technology there. Niu Dun, China's vice minister of agriculture, said the project will be further expanded within the next three years. African countries have grassland and rich resources for fisheries, but they lack funds and infrastructure, Niu said. China can help them tap their natural resources and achieve self-development. According to Niu, Ministry of Agriculture has signed agreements with 14 African countries, including Ethiopia, Guinea and Tanzania, on agriculture, animal husbandry and fishery. Attending the two-day forum were about 350 representatives from various political parties, government departments and businesses of China and 20 African countries. A series of agreements on agricultural cooperation are expected to be signed during the forum.